Rising above London’s ancient Roman quarter and looking down on the Tower of London World Heritage Site stands Ten Trinity Square – the capital’s former Port of London Authority and its hottest new address. The anticipated development, which will be fully completed in 2017, isn’t simply another renovation of a striking Grade II* listed Beaux-Arts building – it’s a welcomed breath of life for one of London’s most important historical buildings. And with 41 private residences, a private members club and the capital’s third Four Seasons hotel, what a renaissance it will be. 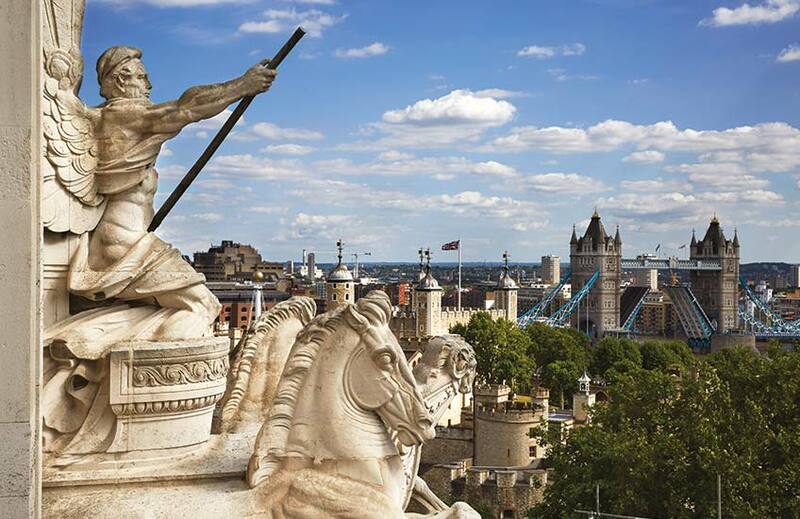 Distinguishable by its grand cenotaph-like structure adorned with a sculpture of Father Thames, the building was once one of the capital’s tallest – second only to St Paul’s. Since then it has had periods where it has been both prized and underestimated. But now it’s back once and for all. The original edifice was designed to stand as a symbol of London’s commercial power and was the work of Sir Edwin Cooper who won the commission for his design’s ingenuity. It was completed and opened in 1922 by Prime Minister David Lloyd George and became an important landmark in the city, resulting in it being chosen to host the 1946 inaugural meeting of the General Assembly of the United Nations. A 1970s renovation to repair the damage sustained during World War II transformed it into the European headquarters of insurance broker Willis Faber Limited. But it wasn’t until four years ago when, in 2011, Chinese enterprise Reignwood Group purchased the site as part of its expansion into the West that the building’s true potential was again recognised. A commanding establishment, Ten Trinity Square benefits from all the advantages of its history. A grand colonnaded portico of Corinthian columns precedes its triple-height facade and was the subject of a 4-year renovation. This beautiful face acts as the canvas for latticed windows and doors, rams head corbels and navigation motifs – a nod to its Port Authority history. 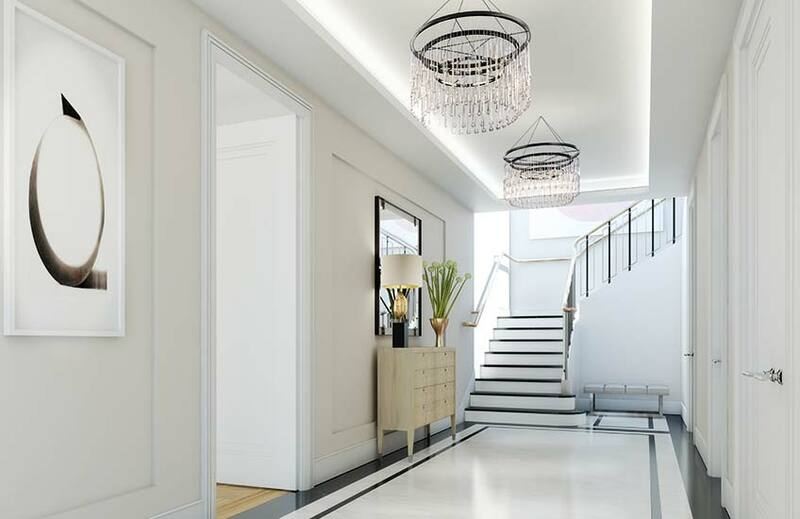 Stepping through the doors, ushered in by the most obliging doormen to be found, you are welcomed into a bright vestibule hung with glistening Art Decoesque chandeliers which are made even more eye-catching through architectural uplighting. Immediately you’re aware of just how uplifting light can be, giving the whole building a positivity – a hopefulness for its exciting new future – which continues throughout. The expansive atrium is certainly breathtaking. A seemingly perfect mirror image characterises the double-height room with classically inspired doorways at either end – a look reminiscent of admired museum buildings. When construction is completed, this Italian Subiaco marble-clad space will house the five-star Four Seasons hotel reception and a luxury retail arcade. 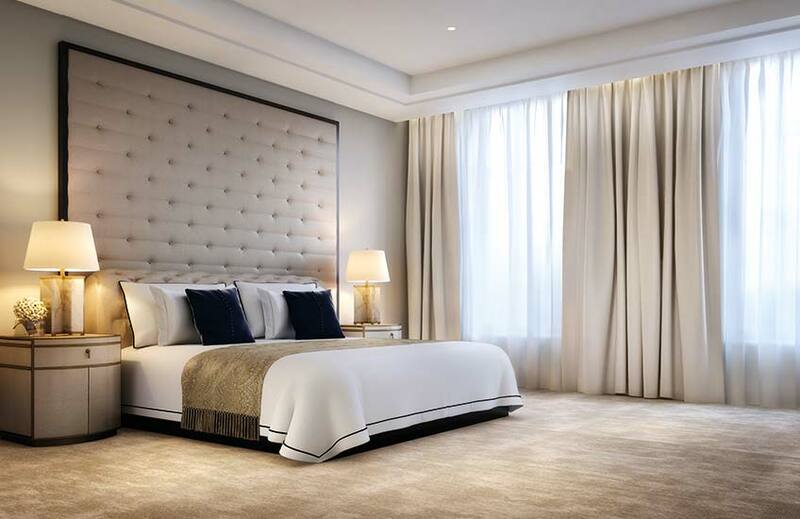 The Residences at Four Seasons represent an exciting new venture in the building’s history – the first time it will be used partly for residential purposes. Unsurprisingly, these residences (which are located on floors three to seven) are set to be the best of their kind, truly offering the best of both worlds – a place to call home with all the amenities and privileges of a 5-star hotel. 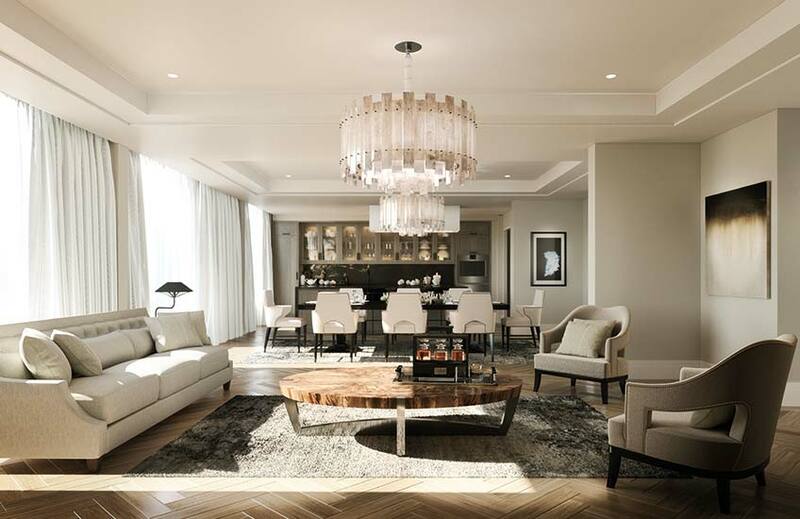 Headed up by Inge Moore, European President of Hirsch Bedner Associates, the apartments convey a sense of understated luxury. “We wanted to reflect the building’s grand story and location, but with an artful blend of old and new, traditional Englishness and Chinese culture,” explains Inge, “Keeping the spirit of the building alive was of upmost importance to us. 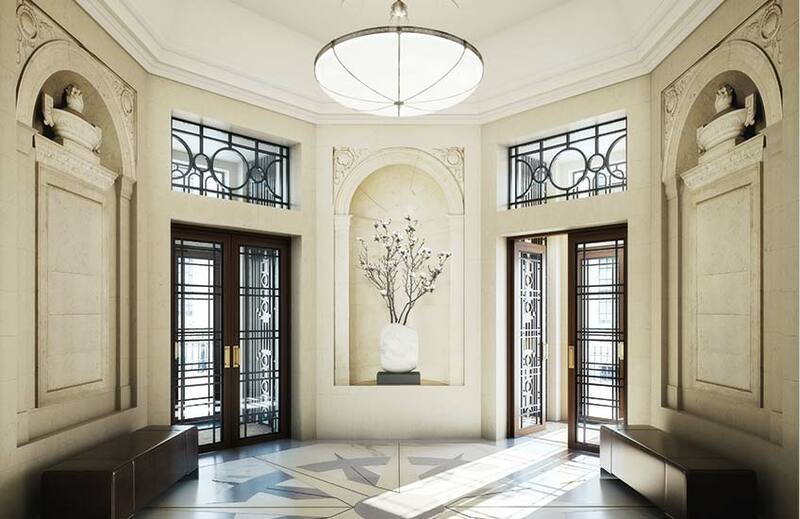 Each residence, with its private imposing entrance lobby, has a great sense of arrival. We want residents to feel they’ve marked their place in the pages of history”. The entrance lobbies Inge speaks of – four in total – are situated at the corners of the building, giving residents the choice of accessing their homes discreetly if they wish. These areas stay true to an existing aesthetic with niches filled with marble urns and a pendant light in keeping with the original era. The apartments themselves emanate modern luxury. 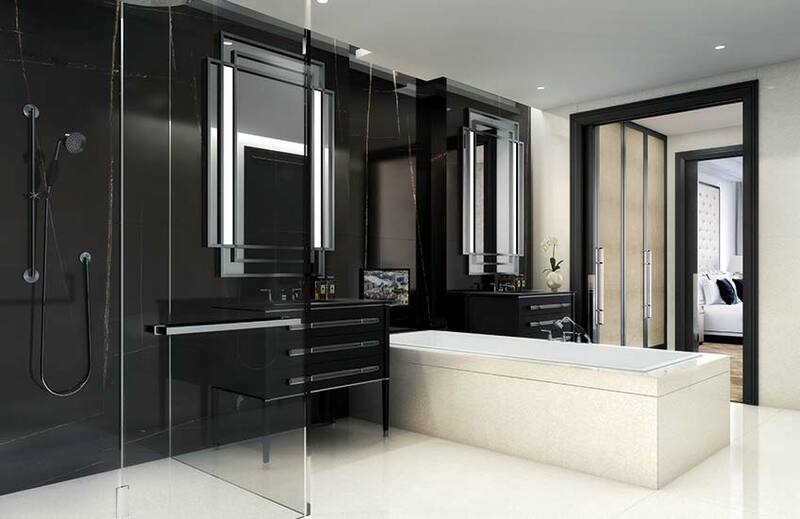 British black lacquered entrance doors and marble-washed foyers will make coming home each day a real treat. A foundational colour palette of black, white and grey is at once contemporary and also appropriate to the era of the building. Not to mention a timeless combination. In the living and dining area, tiered alabaster chandeliers act as anchors to the separate social areas of the open plan design and inviting furniture silhouettes are elegant yet liveable (Brabbu armchairs sit face-to-face with a mixed materials coffee table and an elegant sofa). In the bedrooms, oversized buttoned headboards make a confident statement in an otherwise clean space – uncluttered and calming, just as one would expect of a luxury hotel experience. Generous bathrooms and walk-in closets continue the monochromatic palette but that’s where restraint ends. No element is considered too small to be enhanced, as feature after feature subtly reveals itself, proving that no part of this design is without thought. “I love historic buildings so as soon as this project came up I was really excited to work on this,” Inge informs, “For each historic project there’s so much research looking at these old buildings and seeing how you can reinterpret them into something new and wonderful.” New and wonderful are words which spring to mind when contemplating Ten Trinity Square. Clearly a lot to handle for one firm, the Four Seasons hotel – a hundred-room-strong design – is under the direction of French designer Bruno Moinard, as are the public areas of the building, including the French restaurant – La Dame de Pic – the private members club, and the first Château Latour Room outside Bordeaux. 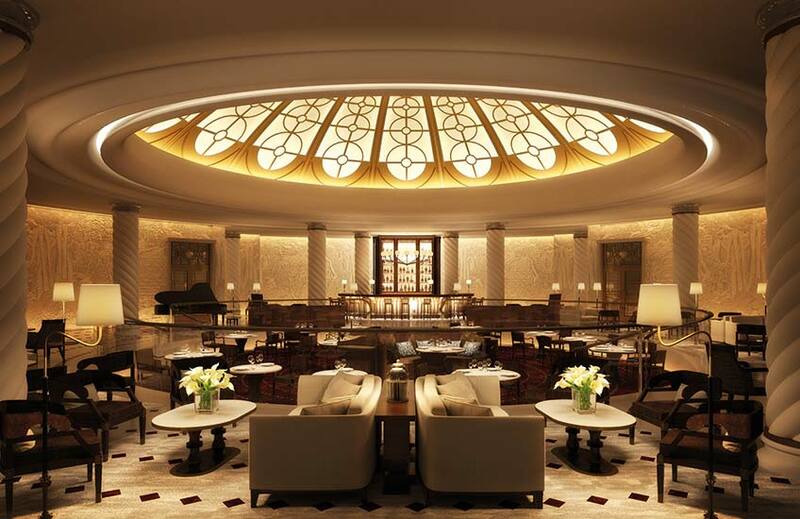 The hotel’s Asian restaurant Mei Ume is set to be designed by Hong Kong-based firm AB Concept. In acknowledgement of the building’s commercial trading past, the hotel’s style diverts from the rest of the project with an East-meets-West sensibility. Nothing is out-of-place though thanks to the restored mouldings and coffered ceiling which unites it with the rest of the building. In one of the heritage suites – the first to be completed – a four-poster bed reaches the height of the room and is topped with a delicately pleated pelmet, accented with a pretty chinoiserie wallpaper which lines the walls in between the panelling. A Wired Custom Lighting chandelier steals the show in the bathroom which is itself wonderfully grand in all its high-ceilinged glory. Back to the social areas, where residents and guests can mingle, the careful labouring continues. The work-in-progress Portland stone rotunda is a coup for the developers. Behind the main lobby’s hotel reception desk will be found passageway to the central copper-trimmed design – a modern construction led by Aukett Swanke and inspired by the building’s initial rotunda, itself informed by the silhouette of St Paul’s dome. This will house an all-day dining restaurant. Until then, this area is concealed by the development’s introductory exhibition, featuring two tremendous globe discs – a symbol of Ten Trinity Square’s vision to be a location that links, explores and expresses the cultures of people all around the world. The only space to surpass the rotunda in terms of painstaking research, development and restoration would arguably be the third floor’s United Nations room. 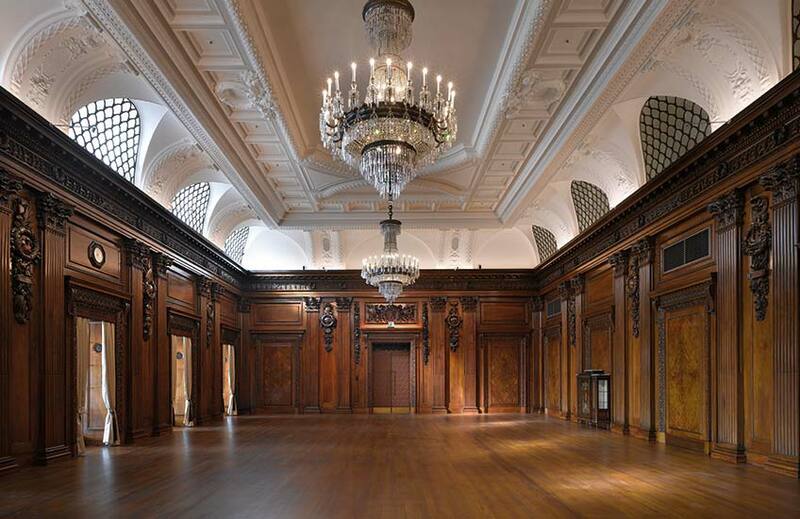 Described by Kalina Boyadjiew, Reignwood’s Vice President of Sales & Marketing, as Ten Trinity Square’s “pièce de résistance”, the United Nations room took four years to restore it to the glory it would have enjoyed during that 1946 inaugural meeting. Just entering the space is evidence of its provenance as a wave of rich wood notes hits you as soon as the double doors are opened. Two-thirds wood and one third plasterwork, the room is exquisite. Its burl walnut panelled walls are richly carved with motifs related to its Port Authority and geographical history (including a tribute to Samuel Pepys who wrote his account of the Great Fire from a nearby location). Its ivory vaulted ceiling – lined with scale-like mullioned windows – is intricately adorned with coffering and egg and dart and laurel wreath motifs. Through its curtained windows, one has a perfect view of the Tower of London and, for a moment, you go back in time. Before visiting, one might assume that Ten Trinity Square will feel too grand – certainly not the first place one would choose to live. But exploring the building and experiencing its details intimately is a different story. Yes, a impressive structure overall, but its corridors, rooms and social areas have all been effectively separated and are even still mapped out by the ceiling’s impressive mouldings – as if it had always existed that way; its original features sympathetically treated. The main takeaway from Ten Trinity Square is that it’s really a bridge between residential and hospitality, in the best way possible. As Kalina explains, one will find everything they could need at Ten Trinity Square – privacy at the end of a long day, socialisation when desired and a ready-made network. It successfully brings all aspects of lifestyle together in one exclusive address – an urban village if you will. Whilst it has been a fair few years since Ten Trinity Square held the attention of the world, its new phase of its life is sure to return it to its former status. 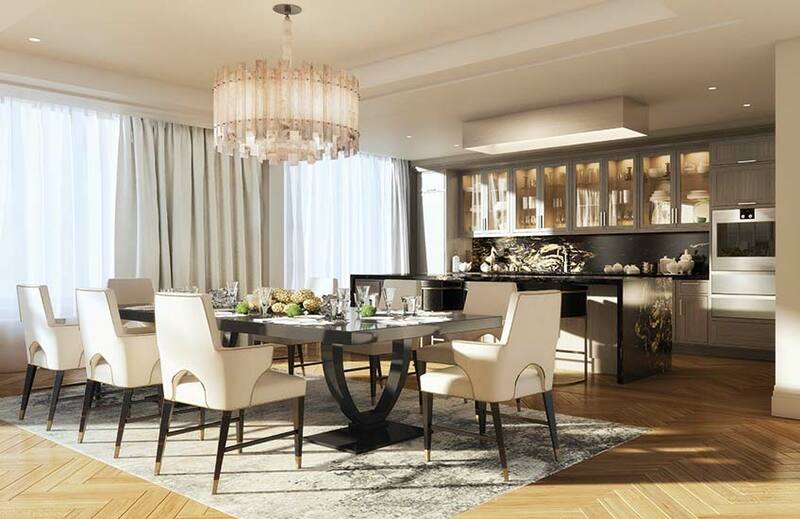 Prices for Ten Trinity Square, The Residences at Four Seasons start at £5 million. For enquiries, call +44 (0)20 3297 9300. Tour the show apartment’s beautifully constructed classical interiors here.